The Frogs Croaked Cleverly, but the Cows Continue Drinking Water from the Pond – Wie weiter mit Humboldts Erbe? The 205 seats of the patina-covered, large lecture hall of Hamburg’s Museum of Ethnology (Hamburger Völkerkundemuseum), built in 1912, with its all-around wood paneling, must have seldom been occupied to the last seat in recent years. At the same time, more than 80 people who were no longer let in jostled in the foyer outside the doors. 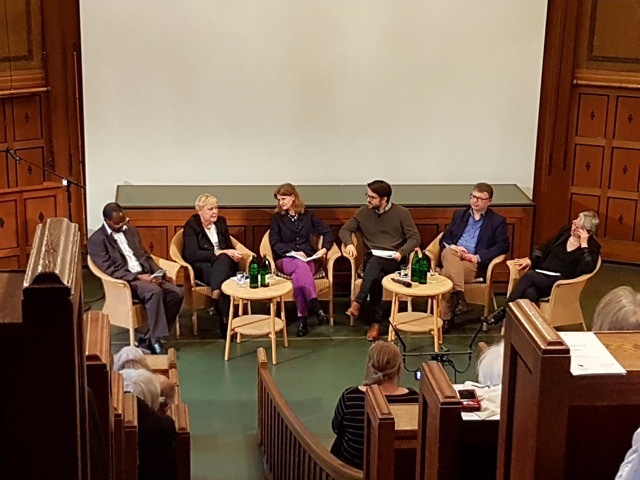 The museum, under the new Director, Dr. Barbara Plankensteiner, previously of the Vienna World Cultures Museum Wien and Yale University Art Gallery, had invited people to a discussion of “Colonial Knowledge in History and the Present”, and a large audience had come. Apparently, the educated classes currently display something like momentum, a new dynamic and intensity in dealing with the colonial “heritage” – after postcolonial activist groups and a few historians, ethnologists, and scientists from related fields fought so long and from a very marginalized position against “colonial amnesia” and apathy. That we also have to do with a colonial aphasia, a deep-seated political and societal, historically acquired, multimodal disturbance and destruction of language repeatedly became visible in the podium discussions and the audience debates. But at least in part, the invited podium guests brilliantly elaborated and commented on this colonial linguistic disturbance. © Museum für Völkerkunde Hamburg. Photos: Arne Bosselmann. Joachim Telgenbüscher, Jürgen Zimmerer, Anne Kwaschik. Dr. Anne Kwaschik, a historian and researcher of science currently in Paris, opened the discussion with a clear statement on the centrality of knowledge (and not merely oil, spices, and copra) as possibly the most important resource in colonialism. She diagnosed a glacial tenacity and petrifaction of colonial orders of knowledge that characterize Western and global sciences to this day. The German government’s fostering of Area Studies, as Kwaschik maintained about her own scientific specialization, still follows the same arguments as during colonialism or the times of the Cold War. Silke Göttsch-Elten, Professor for European Ethnology at Kiel University, unfolded a broad panorama from the establishment of folklore studies and ethnology in Europe around 1900 and the accompanying debates about primitivism and “sunken cultural goods”, which would have been inconceivable without the colonial impetus and context, to the polyphonic critique of colonially shaped schemata of perception that the ethnological disciplines have formulated since the 1970s. In a lively impromptu analysis using the example of the concept of “indigenous knowledge”, Barbara Plankensteiner (an anthropologist / ethnologist and since April 2017 the new Director of the VKM Hamburg) and the historian Jürgen Zimmerer (Hamburg) worked out how – even now, in precisely the moment that we sat in the lecture hall of the Ethnological Museum on September 26, 2017 – colonial schemata of perception and knowledge ordered and reproduced the discourse. “We are in the middle of things, we are cementing this even here and now at this event,” said Zimmerer and Plankensteiner in answer to the otherwise judicious and well-prepared moderator and journalist for the history magazine Geo Epoche, Joachim Telgenbüscher, who had asked Elisio Macamo, African Studies Professor from Basel, about the contribution of “indigenous” knowledge to colonial knowledge – because the distinction between “indigenous” versus “other” (Western? scientific?) knowledge perpetuates precisely the dichotomous templates and hierarchies of colonial orders of knowledge that 600 years of colonial knowledge have inscribed in us. “Ethnographic museums have contributed to the stereotyping and essentializing of cultures.” Our task today, they said, was to question these orders (including the separation of the art museum from the ethnological museum), which are still considered completely normal. The division of the world in collections and the fiction that one could describe a whole continent with collections, “must be broken today,” said Plankensteiner. According to Zimmerer, precisely these schemata form the colonial heritage that influence us the most and that are the most difficult to overcome. It was Elisio Macamo who surprisingly and quietly introduced another position to this dialog, which still finds little resonance in debates in newspaper culture supplements on the need for postcolonial memory policies and an extensive new orientation of ethnographic collections and museums. Macamo reminded listeners precisely that language-hygienic measures under the motto “avoid speaking of indigenous knowledge because this way of speaking perpetuates colonial hierarchies”, despite their plausible justification, run the risk of ignoring the experiences of all the people whose everyday life was massively and lastingly characterized as “indigenous”. Their centuries of experience with violence and alienation still have to be publicly heard in the first place: “May I insist on being termed indigenous?” But above all, Macamo sketched a scenario of necessary debates about European and scientific values. These debates would have to actively address the double bind consisting in Western Europe’s negation of the Enlightenment in colonialism, while legitimizing its own economic and political dominance with these values to this day. We have to find a language to narrate, in public and in the museums, the silenced and forgotten violent history of colonialism in such a way that it finally becomes part of the official history of Europe and the world. Otherwise, Macamo noted with reference to an African saying, it will remain that “the frogs, whose brows are creased with thought wrinkles, croak while the cows continue drinking water from the pond”. A consensus on the podium was that this is in no way relevant solely or even primarily to anthropology and ethnological museums, but also for history, geography, the legal sciences, and medicine and is comprehensively valid for society, the economy, and politics. There was also consensus in the assessment that the perpetuation of colonial hierarchies still serves today to justify our style of life. Consensual was also, finally, a differentiated assessment of anthropology / the ethnological disciplines, which is aware not only of the colonial constitution of this discipline, but also of its continuous work for the recognition of other forms of knowledge and of being in the world, which, not least, affect ethnology’s practice of constantly questioning and provincializing what the Western world considers acquired and certified. In contrast, many concrete questions remained open about the future of the Hamburg Völkerkunde Museum and the many other ethnographic collections and museums that currently stand with their backs to the wall because of the unresolved legitimacy and legality of their collections. One had the inkling that the broad podium consensus might end when it came to concrete answers: as Jürgen Zimmerer put it, it would be expecting too much of the ethnographic museums to demand that they comprehensively work through colonialism and the debate that society as a whole has suppressed for long. But creating sites of learning that permit actively tackling colonialism ought to be possible. More than 600 million euros should not be spent on the Humboldt project for a one-sided narrative that sought to depict the “German cultural nation without its dark sides”, said Zimmerer. Quite certainly, ethnological museums should invest massively in provenience research, answered Barbara Plankensteiner, but it would be a lapse if one wanted to turn them into museums of colonial history. On this September evening in Hamburg’s Ethnographic Museum, one could surmise that the days of this institution’s name are numbered. But one also has an inkling of the enormous postcolonial terminological work, polyphonic historiography, and recognition of multiple perspectives that will be needed to really arrive at new concepts and new forms of cooperation and ways of making things accessible. Time and money, will and values are needed, as Elisio Macamo kept pointing out. There has still been no official apology for colonial atrocities or the genocide against the Herero; returns of artworks are still resisted even where they are justified and possible. And, as especially Elisio Macamo noted, a new museum that learns from the history of colonial injustice and tells other stories now has to be defended against a public realm and science in which racisms and the justification of colonialism as benevolent have become possible again. Michi Knecht is Professor for Ethnology at the Institute for Social Anthropology and Cultural Research at Bremen University. Based on ethno-/praxeography, she investigates the connections between practices of knowledge production and social forms in everyday life. She thereby combines approaches from social, medical, and cultural anthropology with the perspectives of interdisciplinary science and technology studies (STS). Her ongoing projects ask about the transformation of anonymity regimes at the interfaces between technology/infrastructure, regulation, and social practice and about the dynamics of welfare bricolage. With Friederike Gesing, Michael Flitner, and Katrin Amelang, she founded the Bremen NatureCultures Lab as a think tank and site for developing new questions about the relationship between humans and other species, humans and the environment, and humans and the body. 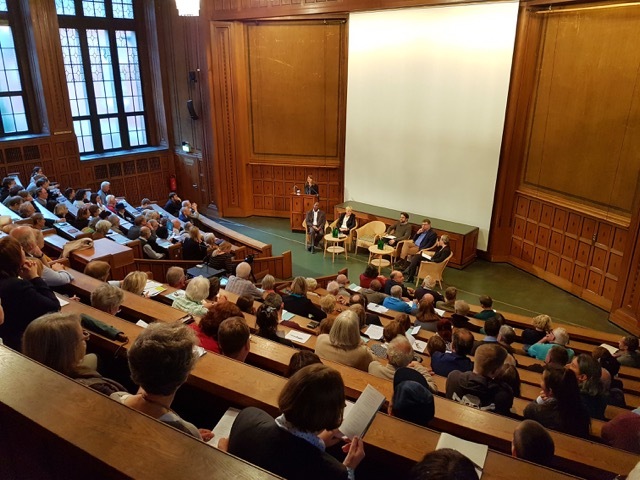 The discussion was organized as part of the program “Humanities in Dialog” by the Hamburger Völkerkunde Museum with the Academy of Sciences in Hamburg, the Union of German Academies of Science, and the Max Weber Foundation.